Established in July 10, 1856, the department of Florida is of historical significance because it was here in the Prado de la Piedra Alta that Uruguayan independence was declared on August 25, 1825. Hence, Florida is also known as Altar de la Patria. Florida is famous for its cuchillas (“wavy lands”), which are a part of the Big Cuchilla that form the branching basins of the Yi and Santa Lucia Rivers. Because of its warm climate and rich rainfall, the department is noted for its fertile fields and verdant grazing grounds for sheep and cattle. Mining is also a leading industry in Florida, with extensive quarrying being done for lodestones, quartz sands and granite. The city of Florida along the Santa Lucia Chico River is the capital of the department of Florida. One of the major sectors of its economy is its agricultural industry, specifically the cultivation of crops and cattle and sheep ranching. There are also a number of lumber mills and factories manufacturing textiles, mosaics and hosiery. The surroundings hills are sources of marble, granite, limestone and iron. The city also offers camping activities for the whole family at two municipal sites—Parque Robaina and Paseo Juan Chazot—along the Santa Lucia River. 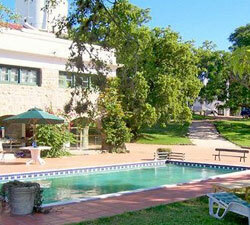 Tourist accommodations are provided by the luxury hotel El Ceibo and San Pedro de Timote, the oldest estancia in Uruguay. It is now a ranch resort and a tourist attraction in its own right.